When my husband Chris and I first started camping - a long, long time ago – there was an abundance of free camps and it was a matter of choosing where to go. How things have changed. 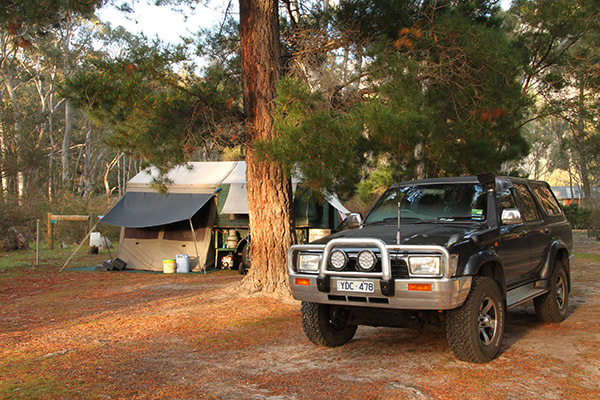 With the radical change in Victorian National Park camping fees, introduced on July 1, 2014, it has become increasingly difficult to find a free or even cheap campsite in the garden state, especially for families. With similar price structures in place in most states, free camps are not as easy to find. So where can you pitch your tent or park your van for free? Plantation campground in the Grampians is a spot where you can spend the night free of charge. This spacious campground boasts 30 sites set among the pine trees. The facilities are limited to drop toilets, picnic tables and wood barbecues. Please note, all the other campsites in this popular national park attract a fee and require a booking. A lovely spot and only a hop and a step from Daylesford, also known as the spa capital of Victoria, Mt Franklin is as small camping area which is also suitable for caravans. Surrounded by conifers and deciduous trees, this free camp offers the traveller true tranquillity. The Cowwar Weir camping area, located west of Traralgon in Gippsland, has plenty of space for RVs and caravans – tents are not allowed. Picnic tables and toilets are available. Further afield, at Split Rock Dam in NSW, large open camp areas along the dam’s shores attract a minimal fee. Situated 64km north of Tamworth, this scenic spot is ideal for water activities. On the northern side of the dam, Glen Riddle Reserve offers free campsites with toilets and a large grassy area right next to the water. Further afield, at Corella Dam, south of Cloncurry, a huge camping area is the perfect base for fishing, boating or canoeing. The dam was originally built to provide water for the uranium township of Mary Kathleen. Campfires are allowed. Home Hill’s Comfort Stop, 100km south of Townsville, boasts toilets, showers, barbecues and eating areas for the weary traveller. A RV dump station is also available. Motor homes, caravans and camper vans are allowed to stay for 48 hours for free. In return the people of Home Hill ask for tourists to buy their supplies in the town and tour their beautiful region. Burra Creek Gorge, 15km east of Burra in South Australia, is a majestic camping location with massive old gum trees, plenty of room and a small stream. Facilities are limited to long drop toilets. Tucked away along WA’s spectacular Rainbow Coast, Cosy Corner provides a magical camping spot with views of beautiful Migo Island. Located between Albany and Denmark, this is one of those unforgettable places you must experience for yourself. Toilets are available, as is a free dump point at Cosy Corner Beach. Why not share your own favourite free camp so others can enjoy it too?